Limited Edition of 1000 Copies on White Vinyl! 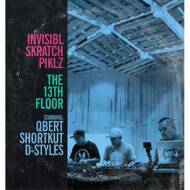 Universally acknowledged as some of the most skilled scratch DJs in the world, turntable legends the Invisibl Skratch Piklz are releasing their first ever full-length album: The 13th Floor. After nearly 16 years apart, original members Qbert, Shortkut, and D-Styles have come together again to record The 13th Floor. Composed with a heavy jazz sound in mind, the roughly 35-minute LP is an amazing homage to what true DJing is – and the perfect embodiment of the iconic Invisibl Skratch Piklz sound. Recorded using three DJ mixers and three turntables, the album showcases the trio’s deft skills and inspired talent, and displays how they have progressed and perfected their sound all while pushing the art of turntablism into brave new dimensions.